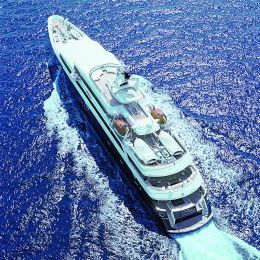 Golden Yachts is a company that was founded in 1997 with the mission of building and administrating super-yachts for charter. 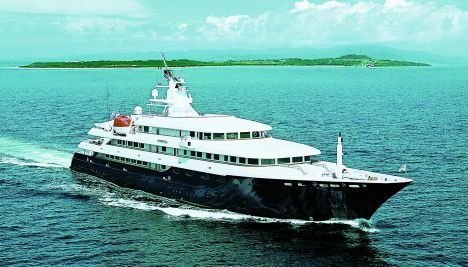 Over the years the company has acquired some of the most luxurious super-yachts used for Mediterranean charters, ending up by managing a fleet of seven boats ranging in length from the 28 metres of the Baglietto "O'Asis" to the 83 of "O'Mega". 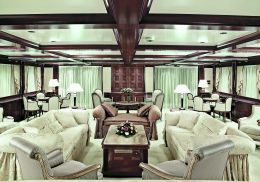 The latter is an 82.50-metre boat, offering accommodation for up to 32 passengers and 28 crewmembers in classically furnished surroundings. Details and finishing have been carefully studied, from the wrought iron handrails on the internal stairways, to the marble walls in the bathrooms. The cabins all have "home-theatre" systems, personal computers for internet access and e-mail, while videogames connected to plasma screen systems are available for younger guests. Fans of fitness on board have at their disposal a Gymnasium & Spa room, Yoga & Pilates Studio, a room dedicated to beauty treatments and massages and Jacuzzi tubs both inside and out. Sailing on the "O'Mega" means entertainment of all kinds, not only those linked to relaxation of the body and mind, but also and above all sea sports. The on- board garages in fact house two 8-metre Luxury Tenders, two 4.5 metre waterjet Sport Tenders, four Yamaha Wave Runner jetskis, two windsurfs and scuba diving, water skiing, fishing, snorkelling and kneeboard equipment. From a technical and safety point of view "O'Mega" meets all the requisites of SOLAS classification. The hull is in steel, while the upperworks are in aluminium. Instrumentation on board includes modern and complete external communication systems, capable of satisfying any communication and navigational needs effectively and efficiently. For further information: Golden Yachts; 41 Athinas Ave.; 166 71 Vouliagmeni; Greek; tel. +30210 9673203-4; fax +30210 9671149; website www.goldenyachts.gr; e mail contact@goldenyachts.gr.